This month’s theme is colour and what it can mean in story and games. Colour is a big part of our world, we use it in many contexts and each colour can have multiple important meanings, so it only makes sense that colour is a big part of the fae world too. Different colours can show what powers the fae may have or what they are linked to within the world. 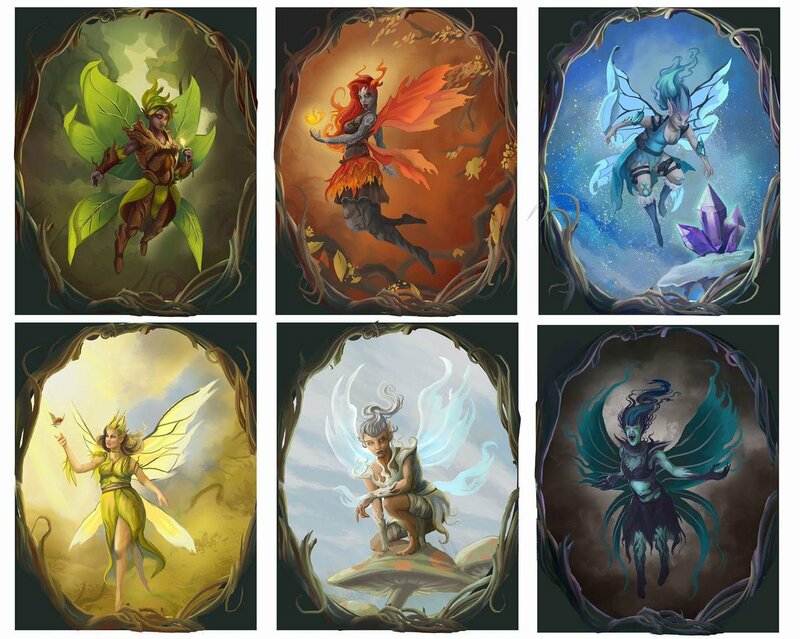 This time I’m going to talk about the small ones with wings, fairies themselves (especially the small pixies), since they can come in all the colours of the rainbow though the most common colours for these little guys are green, blue, white, purple and orange. This piece talks about how they can be seen within popular culture: stories, books, and games. They show their colour in a few different ways: skin, wings, clothing, their fairy dust, or their glow. A lot of fairies have peach coloured skin and wear clothing or have wings of one particular colour, this can be any colour, such as pink or yellow or reddish-brown/orange but that colour usually links them to something like a flower or season. Plant fairies are one example of these nature-linked fae, each fairy is linked a type of plant, most often flowers but those can include the flowers found on trees. They not very powerful and their job is to help their plant grow and spread. The flower fairies that were depicted by Cicely Mary Barker in the 1920s are a form of this type of fairies, the art work is less than a century old but the concept that there are little fairies for plants helping them grow and that live within them is eons old. Seasonal fairies are mostly seen in two types – the spring one which dresses in green which is seen as being connected to Nature, life and growth: they help to bring in the spring so jobs like planting seeds, helping them sprout and grow, waking animals, looking after birds and helping the bigger fae within the summer count. And then there the autumn ones they wear the orangey/reddish-brown of the falling leaves and since reddish-brown itself tends to mean harvest and fall to most people, they have jobs like turning the leaves and helping them fall, wilting flowers, making sure the animals go into hibernation, and helping the bigger fae within the winter court. There is one more I can think of that is linked to the seasons, the fairy that has ice white skin which is the colour of cold and ice, this fairy brings ice and spreads frost. Most types of seasonal fairies have a variety of powers that all aid them in bringing their season about. In games (both computer games and tabletop RPGs) they are usually shown in one of the ways. Either they are young and cute, with a normal skin colour and wearing a small dress, serving as part of the scenery in the fairy glade or to help the heroes out; or they are used similarly to imps or sprites, in which case they are a little ball of light or a tiny glowing person with wings and the colour they are is the magic they use i.e blue is water, red is fire, white is ice and green is plant or toxic. The blue fairy is most well known as the fairy that turns Pinocchio into a real boy in the story “Pinocchio” but she is also the northern star which many stories tell us you use to find home and is occasionally wished upon for safety and a normal life – bringing you home. She is depicted as having peach skin wearing a blue dress and as clearly an adult which most other small fairies are not, the blue of her dress could mean many things: health, understanding or magic. The green fairy is the nickname given to the alcoholic drink absinthe because of its distinctive colour and the fact it is known to course blackouts, unconsciousness, hallucinations and bizarre behaviour, and the idea is that you will see the green fairy and she will take you to a happy place as is depicted in the musical Moulin Rouge. Throughout the 1920s this was the drink of choice for writers and artists in Paris and five o’clock was called the green hour back then because of this. She has green skin, wears a green dress and glows green. Purple fairies are everywhere at the moment, they are the cool, goth fairy. Some just wear purple in some way or another, others have a purple tint to their skin other and purple or blue lines like lightning running across their body, those ones can sometimes shoot lightning out of their fingers. Purple can mean cool, does usually mean raw power/ strong magic and sometimes represents evil so watch out for these little ladys.